Attending a quilt show is always more fun with friends. 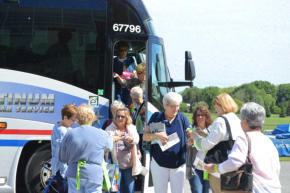 We invite bus tour companies, quilt clubs or guilds, quilt shops, senior citizen groups, or friends that enjoy outings together to organize a group and take advantage of our discounted group rates. Q. What is a group? A. A group is ten or more that will be attending the show at the same time. They must attend the same day and enter the show as one group. A group could be ten or more from a club, shop, or a group of ten or more friends. The group does not need to arrive on a bus/coach. Q. What is the group ticket price? A. $8 per person per day, or $16 per person for a weekend pass. Entire group must enter show at the same time to receive the group ticket price. Group tickets can be purchased in advance or ad the door. Q. What are the advantages to organizing a group? A. Advantages to organizing a group are: • No standing in line to purchase your ticket. • A packet including the group’s wrist bands, programs, and other information is set aside for he group leader to pick up when the group arrives. • Each in the group saves on the cost of the ticket. • Group must enter the show as a group. • $8 per person (day admission) or $16 per person (weekend pass) • Download the Group Registration Form • Pre-register your group by completing and mailing the form to the QuiltFest Group Coordinator as soon as possible. No fee to pre-register. • Finalize your registration by April 30, 2019 with the number attending and pay the total due. Adjustments can be made the day of the show if more (or less) decide to come with the group. Number entering the show must be at least 10. 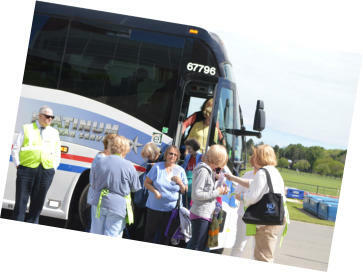 We welcome large groups that may arrange transportation by tour bus. Tour bus groups will receive the following: • A show volunteer will personally welcome your bus, give you a brief overview of the show, location of restrooms and food, and give the bus coordinator a packet containing wrist bands and programs. • Your bus will discharge the passengers close to the show entrance and pick you up at the end of the day near the show entrance. • You will enter the show floor directly avoiding any lines. Prior to April 30, 2019 register your group for free. Payment in full due April 30, 2019. April 30, 2019 and after, register with full payment. Looking for a group attending Genesee Valley QuiltFest? Can’t find a ride to Genesee Valley QuiltFest, or not sure you want to make the drive? As open groups register, they will be listed below with contact information. Feel free to contact the group coordinator if you would like to join that group. Registered bus groups. Contact directly for information.